"Bottled Light" - Conclusion: "Orange Crush"
The Green Lantern Corps with the help of the Sinestro Corps finally manage to get the upper hand over Lar Fleez. 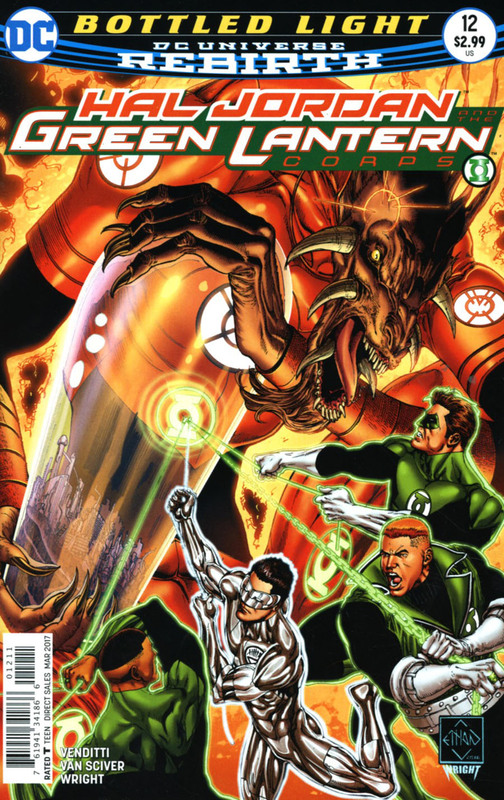 With the help of Hal Jordan and Kyle Rayner, the Lanterns are able to defeat Lar Fleez, and restore the city back to its normal size and destination. Story - 5: A strong conclusion to an equally strong storyline, I always felt that Brainiac should be a character whose presence should be on the Green Lantern Corps radar. I was pleased with what Venditti managed to do with the character. Also leaving it open for a sequel to this storyline, as Lar Fleez now has a "ghost" of Brainiac within his orange ring constructs. I hope that that Brainiac can act as some sort of a virus, and attempt to take over the Orange ring of Avarice. Now that would be awesome. Hal Jordan is back amongst the living, and Kyle Rayner has also returned. Will be interesting to have them and both Guy Gardiner and John Stewart back in the GLC. The four human Lanterns are good to have around when trouble hits. Art - 5: Ethan Van Sciver really put a great deal of effort into the art of this final chapter. The sheer amount of detail alone blows my mind. How does this guy do it? I really want to see more renditions of his robotic Brainiac. I hope this look for him returns in the Rebirth DCU. I absolutely love the way each character has a look distinctive to the way they use their rings, the different types of energies released by their respected rings. Sometimes the body language by Van Sciver for characters can look a little strange, but he is the closest artist in comics today that can be compared to as a modern day Brian Bolland. Very awesome work, thank you Ethan. Cover Art - 5: The regular cover by Van Sciver is amazing, all four Earth Green Lanterns all fighting to free the bottled city from Lar Freez. The variant by Kevin Nowlan is pretty neat too.